University of California, Los Angeles U.S.A. The aim of Interaction and Multiscale Mechanics: an International Journal (IMMIJ) is to provide a platform for publication of research results in which interaction and multiscale mechanics plays a vital role. This journal publishes articles with contributions in all aspects of interaction and/or multiscale problems. The problems of interaction mechanics include the interaction of two different subjects/systems, whether they are connected or not, with or without relative motion. The problems of multiscale mechanics include structural, mechanical or material systems with varying length or time scales. 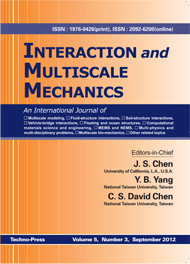 As many contemporary and innovative designs encompass interaction phenomena and multiscale features, papers featuring advancement of theories and applications of interaction and/or multiscale mechanics are particularly encouraged for the journal. Dept. of Mechanical Sci. and Eng. Dept. of Theoretical & Applied Mech. Sch. of Civil and Environmental Eng. Dept. of Applied Math. & Computer Sci. Sch. of Mechanical and Aerospace Eng. Dept. of Mechanical & Aerospace Eng. Univ. of California, Los Angeles, U.S.A.
Ohio State Univ., Ohio, U.S.A.
California Inst. of Tech., U.S.A.
Dept. of Mech. and Industrial Eng. Inst. of Computational Math. and Sci. Inst. for Numerical Simulation and Applied Math. Inst. for Computational Eng. & Sci. Dept. of Civil and Envo. Eng. Hong Kong Univ. of Sci. and Tech. Dept. of Mechanics & Eng. Sci. School of Civil and Envo. Eng. Dept. of Quantum Eng. and System Sci. Dept. of Urban and Envo. Eng. Dept. of Theoretical and Applied Mech. Int’l Ctr. for Numerical Methods in Eng. Strl. Dynamics & Coupled Systems Dept. Considerable longitudinal rail forces and displacements may develop in continuous welded rail (CWR) track on long-span bridges due to temperature variations. The track stability may be disturbed due to excessive relative displacements between the sleepers and ballast bed and the accompanied reduction in frictional resistance. For high-speed tracks, however, solving these problems by installing rail expansion devices in the track is not an attractive solution as these devices may cause a local disturbance of the vertical track stiffness and track geometry which will require intensive maintenance. With reference to temperature, two actions are considered by the bridge loading standards, the uniform variation in the rail and deck temperature and the temperature gradient in deck. Generally, the effect of temperature gradient has been disregarded in the interaction analysis. This paper mainly deals with the effect of temperature gradient on the track-bridge interaction with respect to the support reaction, rail stresses and stability. The study presented in this paper was not mentioned in the related codes so far. Temperature gradient; track-bridge interaction; continuous welded rail; buckling factor; numerical modeling. In this paper, the wave propagation in a generalized thermo elastic plate embedded in an elastic medium (Winkler model) is studied based on the Lord-Schulman (LS) and Green-Lindsay (GL) generalized two dimensional theory of thermo elasticity. Two displacement potential functions are introduced to uncouple the equations of motion. The frequency equations that include the interaction between the plate and foundation are obtained by the traction free boundary conditions using the Bessel function solutions. The numerical calculations are carried out for the material Zinc and the computed nondimensional frequency and attenuation coefficient are plotted as the dispersion curves for the plate with thermally insulated and isothermal boundaries. The wave characteristics are found to be more stable and realistic in the presence of thermal relaxation times and the foundation parameter. A comparison of the results for the case with no thermal effects shows well agreement with those by the membrane theory. wave propagation; vibration of thermal plate; plate immersed in fluid; generalized thermo elastic plate; Winkler foundation. P. Ponnusamy: Department of Mathematics, Government Arts College (Autonomous), Coimbatore, TamilNadu, India. R. Selvamani: Department of Mathematics, Karunya University, Coimbatore, TamilNadu, India. The two-dimensional incompressible flow of a linear viscoelastic fluid we considered in this research has rapidly oscillating initial conditions which contain both the large scale and small scale information. In order to grasp this double-scale phenomenon of the complex flow, a multiscale analysis method is developed based on the mathematical homogenization theory. For the incompressible flow of a linear viscoelastic Maxwell fluid, a well-posed multiscale system, including averaged equations and cell problems, is derived by employing the appropriate multiple scale asymptotic expansions to approximate the velocity, pressure and stress fields. And then, this multiscale system is solved numerically using the pseudospectral algorithm based on a time-splitting semi-implicit influence matrix method. The comparisons between the multiscale solutions and the direct numerical simulations demonstrate that the multiscale model not only captures large scale features accurately, but also reflects kinetic interactions between the large and small scale of the incompressible flow of a linear viscoelastic fluid. linear viscoelastic fluid; incompressible flow; multiscale analysis; averaged equations; cell problems; pseudospectral algorithm. This study is focused on evaluation of the tensile properties of concrete exposed to acid rain environment. Acid rain environment was simulated by the mixture of sulfate and nitric acid in the laboratory. The dumbell-shaped concrete specimens were submerged in pure water and acid solution for accelerated conditioning. Weighing, tensile test, CT, SEM/EDS test and microanalysis were performed on the specimens. Tensile characteristics of the damaged concrete are obtained quantitatively. Evolution characteristics of the voids, micro cracks, chemical compounds, elemental distribution and contents in the concrete are examined. The deterioration mechanisms of concrete exposed to acid rain are well elucidated. concrete; multiscale; SEM; atmospheric corrosion. The paper presents the analysis of two groups of piles subjected to lateral loads incorporating the non-linear behaviour of soil. The finite element method is adopted for carrying out the parametric study of the pile groups. The pile is idealized as a one dimensional beam element, the pile cap as two dimensional plate elements and the soil as non-linear elastic springs using the p-y curves developed by Georgiadis et al. (1992). Two groups of piles, embedded in a cohesive soil, involving two and three piles in series and parallel arrangement thereof are considered. The response of the pile groups is found to be significantly affected by the parameters such as the spacing between the piles, the number of piles in a group and the orientation of the lateral load. The non-linear response of the system is, further, compared with the one by Chore et al. (2012) obtained by the analysis of a system to the present one, except that the soil is assumed to be linear elastic. From the comparison, it is observed that the non-linearity of soil is found to increase the top displacement of the pile group in the range of 66.4%-145.6%, while decreasing the fixed moments in the range of 2% to 20% and the positive moments in the range of 54% to 57%. This paper investigates the effects of sports ground materials on the transfer characteristics of the landing impact force using a coupled foot-shoe-ground interaction model. The impact force resulting from the collision between the sports shoe and the ground is partially dissipated, but the remaining portion transfers to the human body via the lower extremity. However, since the landing impact force is strongly influenced by the sports ground material we consider four different sports grounds, asphalt, urethane, clay and wood. We use a fully coupled 3-D foot-shoe-ground interaction model and we construct the multi-layered composite ground models. Through the numerical simulation, the landing impact characteristics such as the ground reaction force (GRF), the acceleration transfer and the frequency response characteristics are investigated for four different sports grounds. It was found that the risk of injury, associated with the landing impact, was reduced as the ground material changes from asphalt to wood, from the fact that both the peak vertical acceleration and the central frequency monotonically decrease from asphalt to wood. As well, it was found that most of the impact acceleration and frequency was dissipated at the heel, then not much changed from the ankle to the knee. coupled foot-shoe-ground interaction model; landing impact force; ground condition; ground reaction force; acceleration transfer; frequency response.